Most people think that cats groom themselves. But in reality, cats lick themselves. Grooming and licking are two entirely different things. 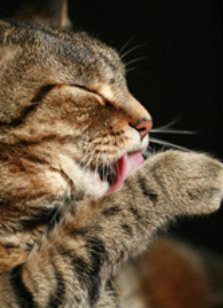 When a cat licks itself, it is covered in saliva and dander. Nothing is done during the licking process to relieve a cat of tangles, mats, fleas, dandruff, skin conditions, and unsanitary things hanging from its hindquarters. Instead, after years of licking itself, a cat sleeps on the sofa or curls up on the very pillow you lay your head on at night. At Primping Pooches & Cats we don’t lick cats, we actually groom them. We use the best products, high quality tools, and advanced techniques to remove tangles and mats, degrease coats, remove excess shedding, clean up dirty hindquarters, trim nails, neaten up overgrown faces, and fix any other problems that a cat may have that simply are not fixed by licking. We are here to make your life, as a cat owner, easier and cleaner. We are here to make your cat look and feel better and do it in the safest and most efficient way possible. After all, a groomed cat is a happy cat. And the people who get to live with them will be happier too! In the end, you end up with a clean cat that looks and feels better than you ever thought possible. We are professional cat groomers and know our stuff! We received our training from the National Cat Groomers Institute of America, Inc and obtained our Certified Feline Master Groomer certification after passing a total of nine exams that include both in-depth written material and actual hands-on grooming.